Earlier this summer we accepted a referral for a 13 month old boy and have begun the paperwork to bring him home. His name is Zhang Shuo- and we plan on calling him Malachi Shuo LaMotte. You may remember that we were planning on adopting a little girl, at our most recent Home Study Update, we opened our parameters to include boys- and we received a referral literally within hours of notifying the International Office at Bethany. We met with our medical team to go over the health assessment and spent time in prayer before making the decision to accept the referral. As with any adoption- and especially international- you cannot always ascertain all the health issues, especially cognitive, from the medical reports you receive. While we don’t have a firm timeline, we hope to bring Malachi (as we’ll call him) home before Christmas. We have seen God at work by the quick movement of the adoption process and through favor with some scheduling with Immigration here in The United States. Our girls bounced back quickly from the revelation of a boy rather than a girl and are looking forward to adding to the family. Both Abbie and Chloe still prefer a girl, but say they will love Malachi. Below is a picture of Malachi when he was six months old. We continue to covet your prayers for our adoption. 1. Pray for Malachi’s health. He is a little guy for an 13 month old, but is tracking well on some of his physical benchmarks for his age. Pray for his cognitive development as well. Pray that he would be prepared to become part of our family. 2. Pray that God would continue to provide for our finances. We are very close to our goal- the last of it primarily being our travel expenses. This number could inflate if we leave for China on short notice. 3. Pray for our family would prepare our hearts and our home for Malachi to join our family. We know there will be challenges along the way- but we are excited about our family expanding to 5! 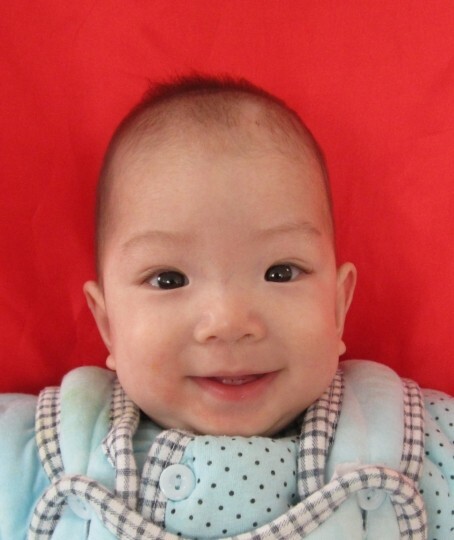 This entry was posted in Adoption and tagged adoption, China. Bookmark the permalink. I am overjoyed to read about your sweet boy!! I was 6 when my brother was adopted from South Korea and it was one of the most exciting things that ever happened! I loved every minute of being an “older” sister! 🙂 Praying for the Lord’s full provision and protection over your growing family! Thanks Lauren! We are nervous and so very excited at the same time. We can see Gods hand through the whole process! More updates will be coming as they happen. We are so excited for you all! God is amazing! Look forward to hearing the many blessings that God has in store for your family. Thanks! We are very excited- and can’t wait to bring him home. Lord willing, you’ll get to meet Malachi soon as well! So excited for you all! I love his sweet little face and I know you all are eager to get to him. We will pray for your family and for him. Thank you for the prayers Allison!